I became interested in hybrid gearing after acquiring my 1973 Jack Taylor Tourist, about 9 years ago. The bike features a single front chainring, 6 speed cassette and a 2 speed Sachs Orbit internal hub. That gives it 12 gears overall, with a good range for the kind of riding I do, as the internal hub’s lower gear is about a 33% reduction, which is quite significant. For awhile, I didn’t think much about this interesting arrangement, and instead just enjoyed riding the bike, and being able to do a substantial downshift while sitting still at a stop light. 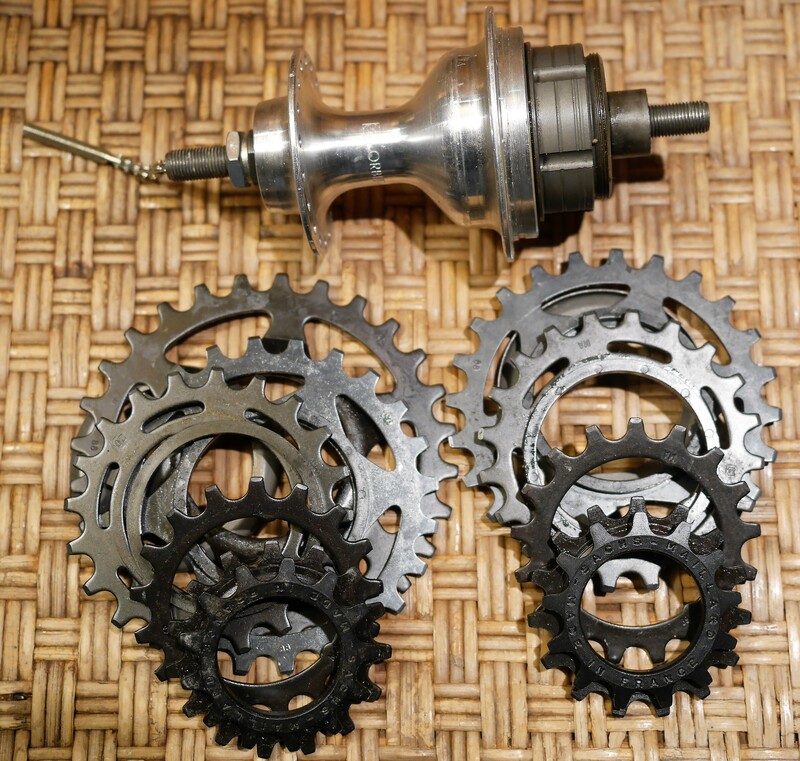 Sachs Orbit 2 speed hybrid hub with 6 speed cassette. There are a number of ways to accomplish hybrid gearing. You can forgo a front derailleur, and use an internal two or three speed hub to take the place of multiple chainrings. You can also use multiple chainrings with an internal hub, and forgo the cassette/freewheel. Or, you can be like Sheldon Brown and do both, achieving a 63 speed bicycle – his beloved “O.T.B.” which used a 3 speed SA hub, a seven speed cassette, and 3 chainrings. Doing the math: 3 x 7 x 3 = 63. So with modern technology, let’s calculate the possibilities: a 14 speed Rohloff hub, paired with an 11 speed cassette, with a triple chainring = 462 gears! Probably that set up would be a mechanic’s nightmare, so if you really want this many gears, I suggest you purchase a continuously variable NuVinci hub – but be prepared to deal with quite a bit more than a couple of pounds of extra weight. 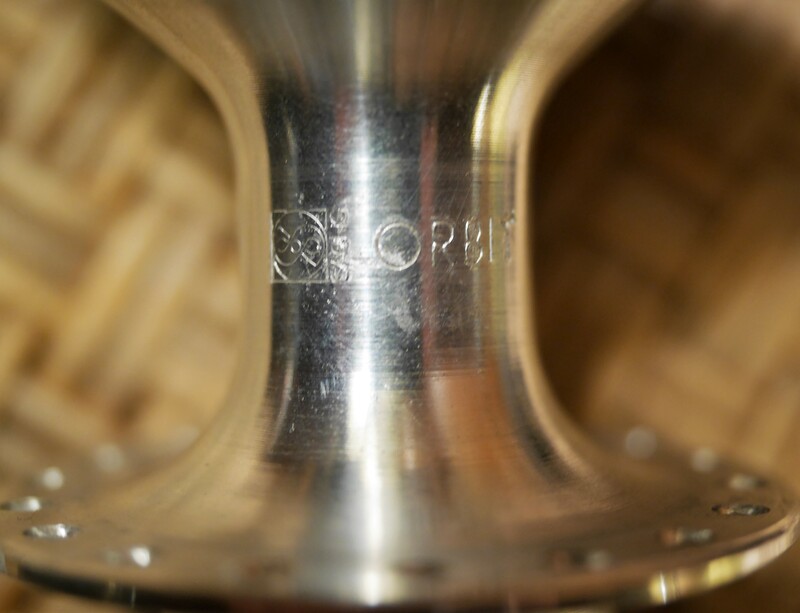 There is really only one source on the internet for information about the Sachs Orbit 2 speed hybrid hub, and that of course is the Sheldon Brown site, with additional information and clarifications by bike guru John Allen. One of the things I worried about with this hub on my Jack Taylor was being able to find replacement parts, given that the hub was so rare. 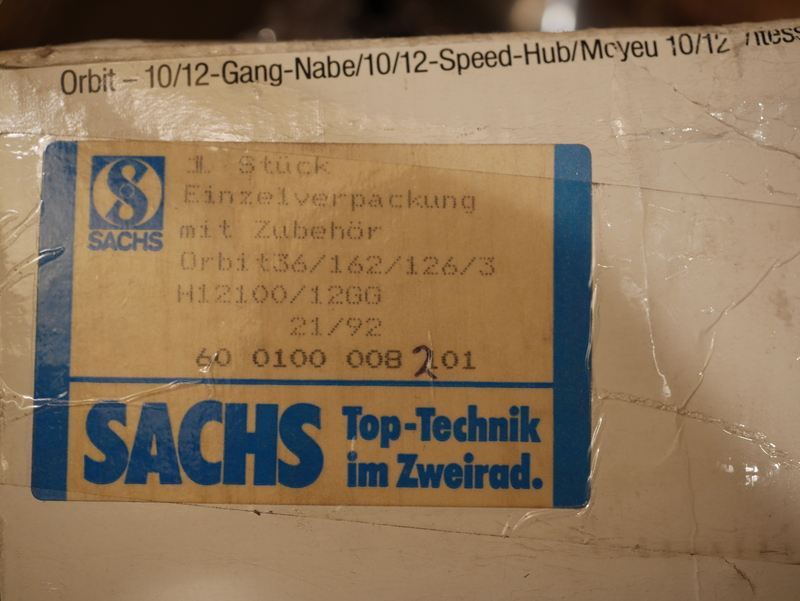 Fortunately, a while back I found a NOS Sachs Orbit hub, pictured above, which I could use as a replacement in case something went wrong. Meanwhile, the original hub is working just fine, and needed only occasional lubrication with automotive oil. I had sent the hub out for a rebuild nine years ago, and it is working perfectly, still. Be careful with these spindles! 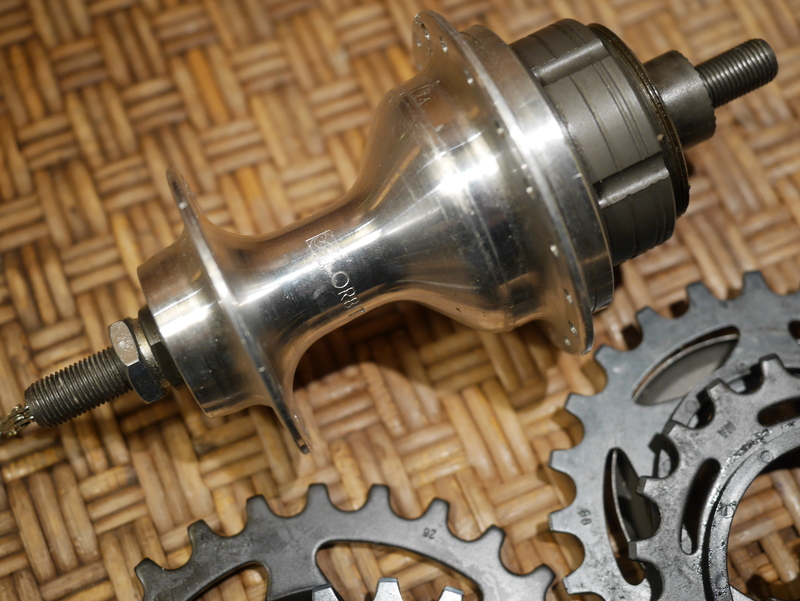 The replacement hub I purchased is quite lovely, and has two different cassette options – for 5 or 6 speeds. 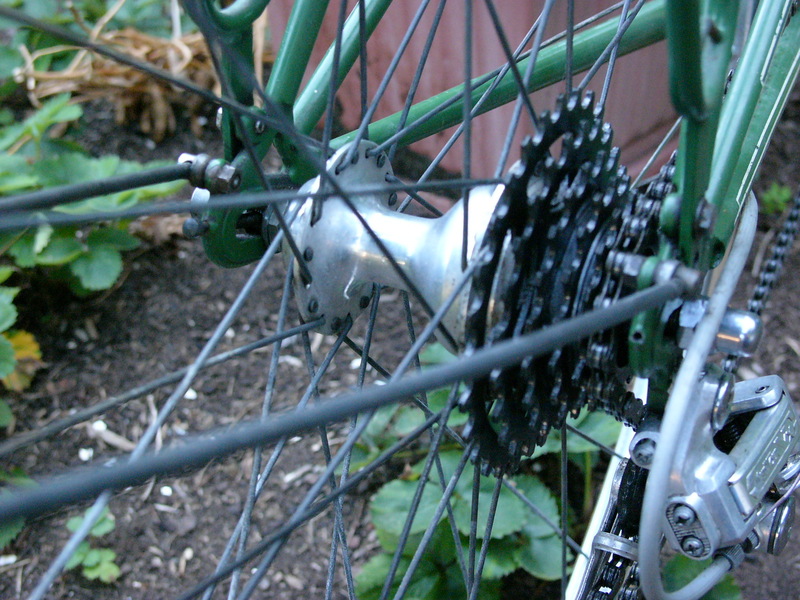 The cassette cogs and spacers slip onto the freehub with tabs to line up the rings, except for the final smaller cogs, which screw onto the freehub. 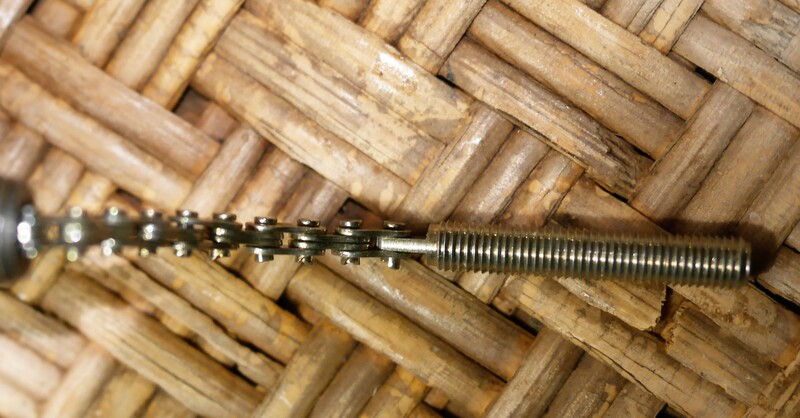 As one pedals, these smaller cogs with screw-on threads will get tighter and tighter. Because this replacement hub is so nice, I have been thinking about using it to build into an interesting wheel set for a road/commuter bike, rather than keeping it in reserve for spare parts. 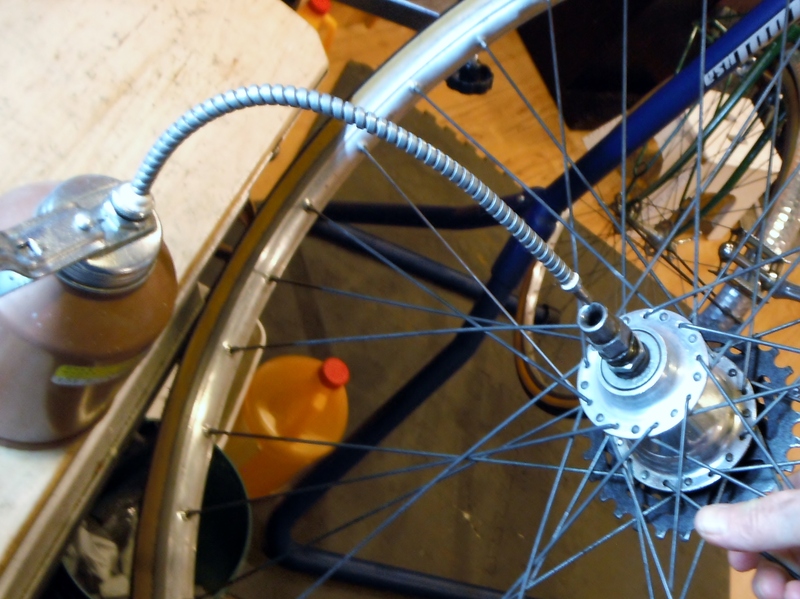 One of the convenient features of this hub is that it can be operated by pretty much any front derailleur shifter, as there are only two positions on the hub. And, if something goes wrong with the hub on the Jack Taylor, maybe I will rethink hybrid gearing altogether. The bike’s rear wheel was an alteration from its original 1973 build, and whether or not this rear wheel was built by the Taylor brothers is unknown. However, I have noted that British bikes built in the 60’s through the 80’s sometimes featured hybrid gearing. This was especially true for the boutique manufacturers of that era. Sachs internal hub gears are considered on par with Sturmey Archer, and I will say that is true, based on my experience with riding this Jack Taylor. The hub has been totally reliable. 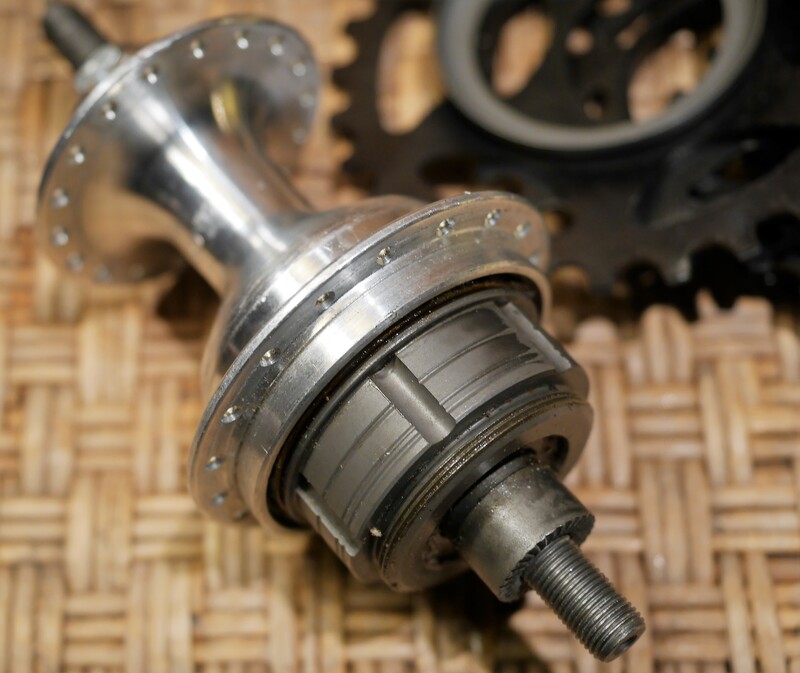 This early 90’s Sachs Orbit 2 speed hybrid hub has 36 holes, so it could work with a number of possible rims. It needs a bit of lubrication to bring it back to full glory, and if I end up needing to rebuild it, John Allen and Sheldon Brown will come the rescue. 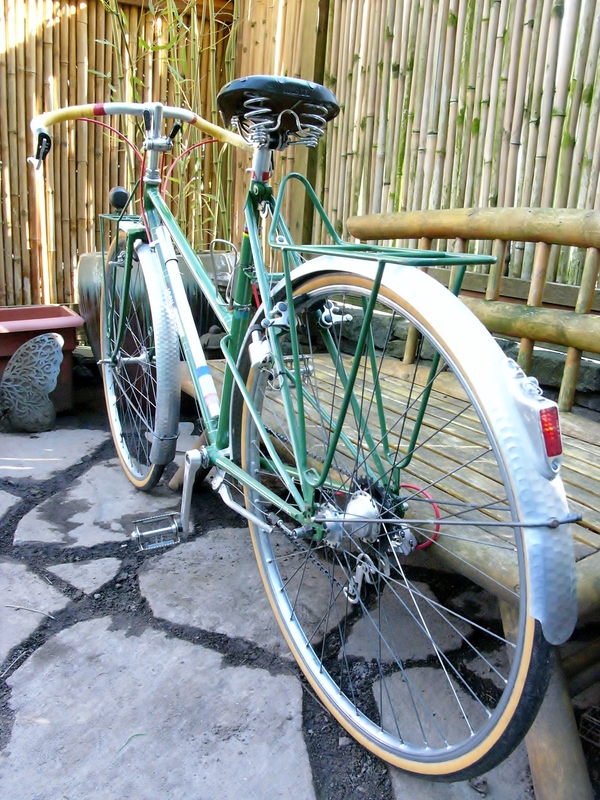 This entry was posted in Bicycle restoration, Jack Taylor bicycle, Vintage bicycle restoration, Vintage British Bicycle and tagged hybrid gearing, hybrid hub gear, sachs fitchel, sachs fitchel hub, Sachs Orbit hub by Nola Wilken. Bookmark the permalink. Most interesting, thank you for sharing this with us! It is truly a beautiful hub. I am sure that it makes life easier when you are caught at the traffic light with the wrong derailleur gear. They do seem rather complex though, repairing them must be a challenge. When I was young I was fascinated by a bike where a Sturnmey Archer three speed hub was modified to accommodate a four speed cluster in order to convert it to a 12 speed. Imagine going through 462 gears in the correct order! I may be wrong, but internal gearing always seems as if there may be more friction involved resulting is less efficiency compared to derailleur gears. Hi Jan, there is some inefficiency in every internal hub, as compared to derailleur drive trains due to friction loss. Another source of inefficiency can be the extra weight. In this case, I would guess that it’s pretty much a draw comparing the extra weight of the Orbit hub to an extra chain ring and front derailleur, as this hub isn’t all that heavy. 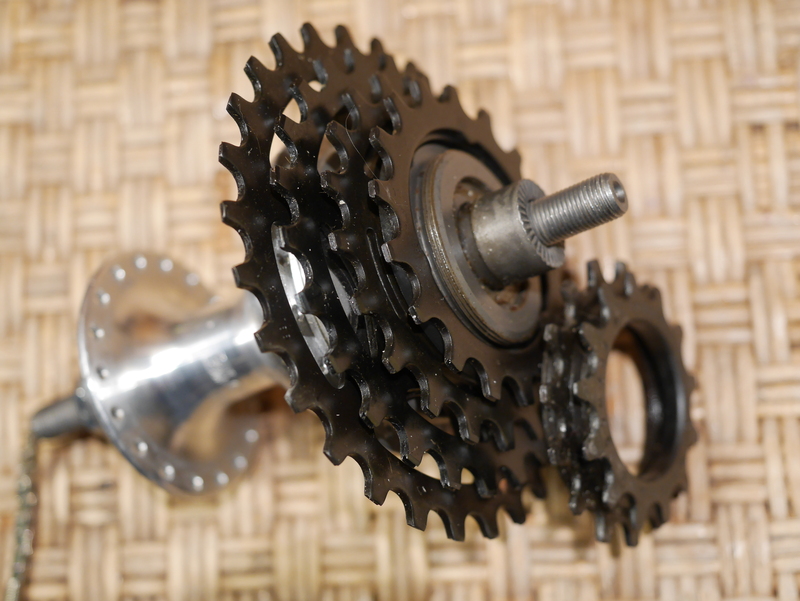 As far as number of gears, most cyclists know that it is the gear range and not the overall number of gears which you should look at when choosing a drive train. The Jack Taylor has a very low gear range, spanning from 27 to 74 gear inches. I use the internal hub downshift as a bailout gear for really steep hills, but otherwise ride the bike as a 6 speed. Wow! I had never heard of such a device! thanks for showing it and describing it for us. Thanks, Martin. 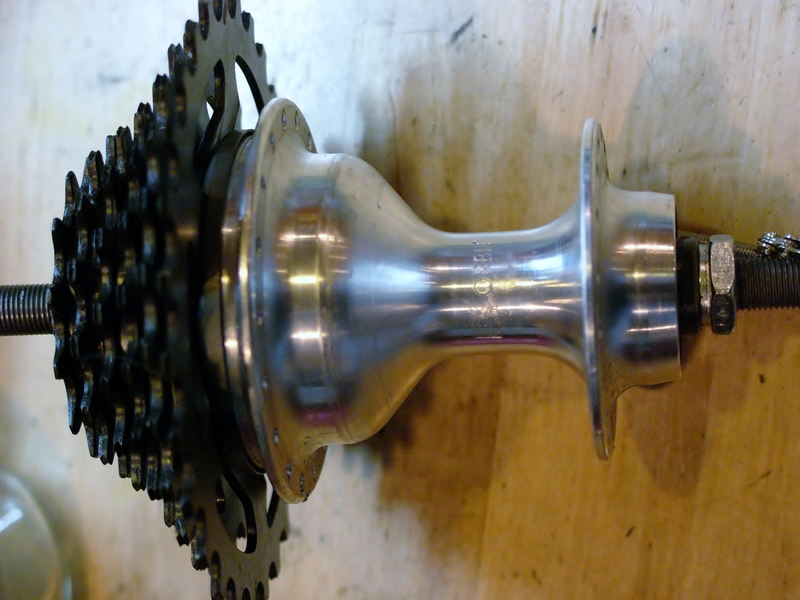 One source for all things related to internal hub gears is Aaron’s Cycle shop up in Seattle. They might have what you need or know where to get it. Thanks for sharing your experience with this modern example of hybrid gearing. Sachs & Fitchel was acquired by SRAM in the late 1990’s. This allowed SRAM to expand into internal hubs. It is my understanding that the 3 speed Dual Drive system uses a single controller to actuate both the derailleur and the internal hub – very nifty! SRAM internal hubs have been proven to be very reliable, and according to bike guru John Allen, have greater efficiency than their competitors – namely SA and Shimano. Yes it is a single control – the derailleur is grip shift on the 8 speed version rapid fire on 9 and 10 “I think” and the 3 speed selector is a simple push button type. But you can use a standard three speed click box control for the hub and bar end or even bifters for the derailleur. BUT and its a big but only if you can get hold of the parts as separates. Usually comes OEM on complete bikes in mid market. BTW we live in Vietnam (Hanoi) where there are at least 4 full functioning Mercier Meca dural bikes ridden each weekend, and around another 5 sitting in the lobbies of hotels all original and fully functional. I tried to buy one a couple of months ago and the current asking price is arounds 4000 USD. A HSE 650b Peugeot with simplex and steel rigida rims currently fetches around 2000 USD. Interesting pricing info – thank you for sharing this.